After your guests have joined you in a joyous ceremony, it's time to treat them to a cocktail reception followed by dinner and dancing. Several events during your reception characterize a wedding celebration - special dances, speeches, the meal and the cake (or dessert). All of them are optional, but this is the beginning of the rest of your lives, together! Take this chance to lavish yourself and your guests with an evening packed full of laughter and memorable moments. 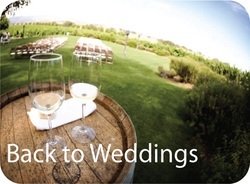 With the "Bride Login" (upper right), you'll be able to tell us which formalities you will be observing at your reception and what songs or announcements accompany them. Here's an example of how you can plan the events online using the "Login". Check out "Julia"'s work on her online Planning Form. This is when your guests get to mingle and relax. 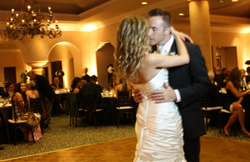 Let us help create the mood you are looking for - fun, eclectic, or go with a theme (Jazz, Blues, Lounge, Reggae, etc.). Even bridge the generation gap with cleverly re-made covers of classic songs by today's artists. We work closely with you and your preferences to create a playlist that is as unique as you are, to ensure that every moment is perfect. Let's kick off the reception by introducing the members of your Bridal Party to your guests, and then making them cheer as the Bride and Groom make their Grand Entrance. Weddings are about families coming together to celebrate your wonderful connection to one another. What better way to fully experience your love than to share it with those close to you, on the dance floor. The Father-Daughter and Mother-Son dances are iconic moments in every classic wedding, the First Dance makes time stand still, and the Anniversary/Money Dances reminds everyone that love is forever. We'll help you to pick the perfect songs to make those minutes shine. Now, its time to officially get this dance party started. In the first 15 minutes of open dancing, all eyes are on the DJ or band as the crowd sums them up and decides whether to stay or leave. 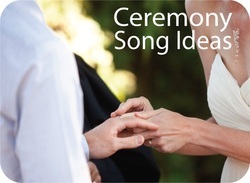 This first open dance set requires the DJ or band to touch on every respected song of each genre (avoiding the cheesy overplayed ones) - Motown, 50's, 60's, 70's, 80's, 90's, 00's, 10's, hip-hop, pop - and mixing them seamlessly, while sticking close to both your "play" and "do not play" lists. What you will have at the end of this 15 minute challenge is a packed dancefloor with all sorts of guests of all sorts of ages and musical tastes, dancing up a storm and working up their appetite for some delicious wedding cake. Once the cake is cut and dessert and coffee served, this marks the point where the older members of your crowd, couples with children and those who have to drive back out of town prepare to leave the party. Now is the time for that second dance set - with the songs on your list that would not have done so well if they were played earlier - like those with a cheese factor of 11 but are personal anthems you and your friends share, those hip-hop songs you wouldn't want grandma to know you love or those dance tracks that you remember clubbing to in Europe that summer when you both met. As we get closer to the end of the evening you'll give your bouquet away to the girls in the Bouquet Toss, and your Garter gets removed and handed down as a souvenir for a lucky guest. The party continues to the last song that will close this epic night to remember.